Be amazed, be very amazed! Top Men (and Top Women) are not fans of plastic – well, except for its remarkable ability to make everyday life easier, less costly, and more convenient. It’s just those icky (technical term) side-effects (proven, and not yet proven) that give us reason to pause. Top Men were once Top Boys. 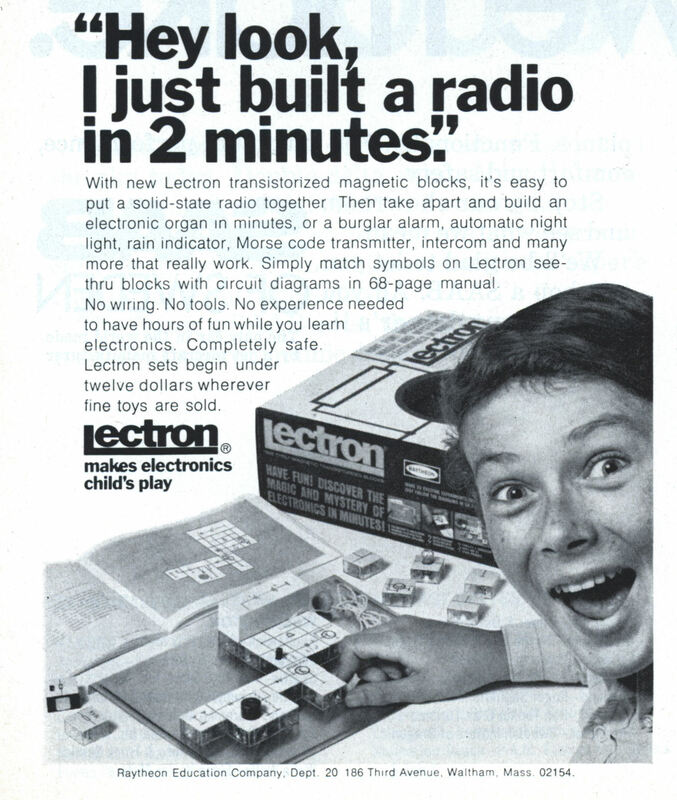 One of the toys (and we use that word loosely) that shaped us was Lectron – an electronic construction set. Electronic construction sets have come and gone over the years, but this one was amazing. Simple, white blocks with the components hidden inside – magnetically snapped together to build all the usual circuits: alarms, blinkers, organs, radios, etc. The difference was how clean and elegant the results were. Not a bunch of wires snapped to springs, across unused elements – or glaring primary colored parts strung together like an explosion in a candy factory. 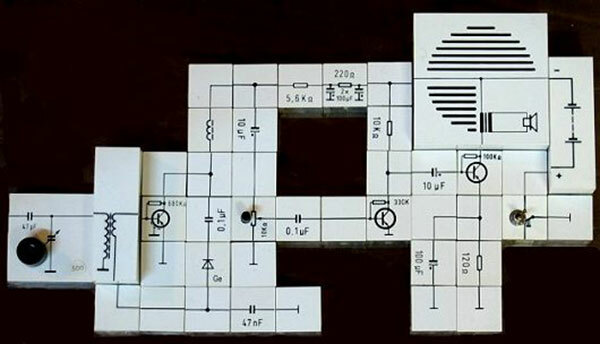 Lectron projects looked like simple schematics – schematics that actually worked. Lectron sets are still being produced in Germany. They’ve even evolved over the years to include newer digital components. But since there is no foreign distribution it takes some knowledge of German and Euros to get them. I suppose Top Men must now add “learn German” to our list of things to do. Wir müssen zu beschaffen Lectron! Here are a great collection of photos of some large Lectron sets. Here is an article from 1967 Electronics Illustrated. Here is an ad from Life Magazine in 1968. Top Men like pi. 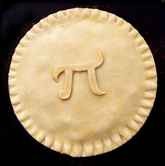 Here it is to a million digits. Feel free to memorize and enjoy. 2) True. And each silk must be pollenated. 3) False. Corn is related to grass. 4) False. China produces about half as much corn as the USA. 6) False. It’s closer to $4 billion annually. 10) False. Corn is number one. 10 out of 10 – Amazing! Truly Top material. 9 out of 10 – Almost amazing! Top in training. 8 out of 10 – A valiant effort, but a couple ears short of Top. 7 out of 10 – You’ll need a few more corn dogs before your’re ready. Under 7 – Don’t call us, we’ll call you. Be a maized! Be very a maized! Time for the Annual Wohba Tribute to Corn. This year we decided to offer a corn quiz to let you gauge just how corn-savvy you are. Answer a few of these true-or-false questions and discover your corn top-ness. 1) An average ear of corn has 500 to 600 kernels. 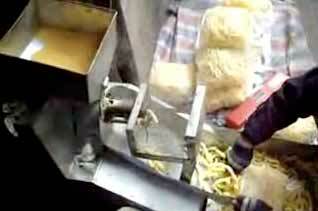 2) Every strand of corn-silk is attached to a kernel of corn. 3) Corn is a domesticated variety of palm tree. 4) China produces twice as much corn as the USA. 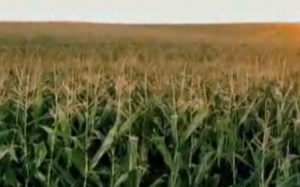 5) 80% of the corn grown in the USA is genetically modified. 6) The USA spends an average of $1 billion in annual corn subsidies. 7) It takes 21 pounds of corn to produce a gallon of ethanol. 8) Popcorn pops when the internal temperature reaches 356 °F. 9) Corn has twice as many genes as the human genome. 10) By weight, only wheat surpasses corn in worldwide grain production. You have one day. Begin. Volcanoes from space – now that’s Wohba material. So what about this amazing image. 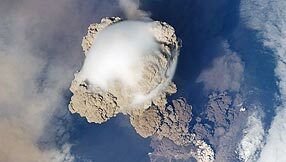 of the Sarychev Peak Eruption in the Kuril Islands a few days ago – taken with a digital camera aboard the ISS (International Space Station). As fate would have it, the ISS was in the right place at the right time for an image that few have ever seen. Top Men are intrigued by the pillowy clouds atop the ash plume, as well as the circular parting of the clouds around the event. Maybe next time we’ll get a video. Nothing like a star party to enlighten us on a galactic level. Top Men were amazed by this time lapse of the night sky which reveals our own Milky Way galaxy. Top Men also like the fact that the teaming masses can do stuff like this. 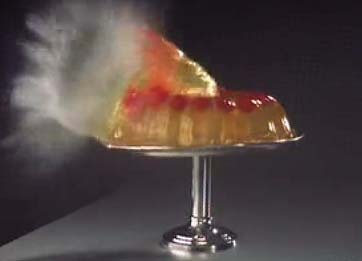 Slow motion (high speed) video is just so doggone amazing – revealing life’s hidden mysteries. Take for example the lowly ladybug. For all of recorded history we simply marveled at the lovely black spots on her red shell, and watched her fly away (because her house was on fire). Little did we realize that behind the beauty there were complex mechanisms at work – allowing the wings to be hidden but elegantly released when required. Wohba! Link. 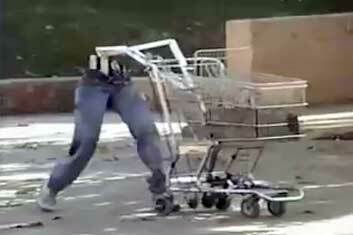 Top Men and Top Women hate shopping, but it would certainly liven things up to shop with this flaming, torso-less, robot shopping cart. Who thinks this stuff up? And now for something completely different! From the rings of Saturn, to terra firma, or shall we say, terra parta!